Clients can avail from us fully Automatic Head Trimming Machine that is easy to operate and can be easily operated by any person without any difficulty. SMT Automatic Head Trimming Machine is efficient to make the head of bolt hexagon or square as per the specific requirement. As requiring low maintenance, our Automatic Head Trimming Machine is hassle free and has long life. The Automatic Head Trimming Machine is simple in design and produced utilizing the latest technologies. All parts of Automatic Head Trimming Machine are made from good material hence it makes the production continuous and error-free. As well, adjustments are simple and easy to perform. 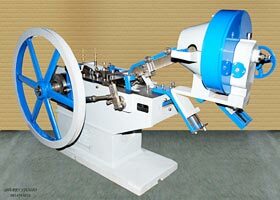 The Automatic Head Trimming Machine can be availed in different specifications from us. We are a recognized Manufacturer, Exporter and Supplier in Punjab (India).